I upgraded my phone recently. I've had an iPhone 6s for s couple of years, but now, I have the iPhone X. When they announced the iPhone X -- it's pronounced "ten" as in the Roman numeral, and only silly people call it the "ecks" -- I decided against getting one. The reason? Well, the $1000 price was part of it, but so was the size. Or what I thought was the size. You see, I used to have an iPhone 6, which was an upgrade from the iPhone 5s. The iPhone 5s had a 4-inch screen. It took a little getting used to the 4.7-inch screen of the iPhone 6. When I went from the iPhone 6 to the iPhone 6s, there was no adjustment period, as I was comfortable with that size phone. I never got any of the "Plus" series phones, which had a 5½-inch screen. My daughter, son-in-law, and ex-wife all had a "Plus" series iPhone, so I had the opportunity to put hands on the device. I didn't like it. It was a little too big. Maybe I would have become used to it, as I did the 4.7-inch screen of the iPhone 6 and iPhone 6s, but I didn't want to. When the iPhone X was announced, I found out it had a 5.8-inch screen. So, in my mind, it was even larger than the "Plus" series, and if the 5½-inch "Plus" was too big, the 5.8-inch iPhone X would certainly be too big, right? It turns out that while the screen has a larger diagonal measure, the overall phone is smaller. The iPhone X is 5.3% wider than the iPhone 8/7/6s devices, while the "Plus" series is 10.1% wider than the iPhone X. The iPhone X is 3.8% taller than the iPhone 8/7/6s while the "Plus" series is 10.3% taller than the iPhone X. The iPhone X screen covers nearly the entire front of the phone, meaning there is more screen per total phone size on it than on other iPhone devices. So, after I put hands on an iPhone X and realized it was not noticeably larger than my current phone, one of my objections was removed. That $1000 price, though. How to get around that? Well, I found a way. Or, more properly, the way was always there. You see, I have an old Verizon plan. It's a 30 GB plan, and I have a pretty good price on it. Some years ago, when I went back to Verizon (long story for another time) they were running specials. How special? Half price, that's how special. You could get a 6 GB plan for the price of a 3 GB plan. Or 10 GB plan for the price of a 5 GB plan. Or, the one I got, a 30 GB plan for the price of a 15 GB plan. Add to that, the fact that I get 19% off my data plan because of an agreement with the company where I work, I'm paying only 40.5% of the cost of the 30 GB plan. By the way, they stopped that offer after a couple of weeks when they realized what they were doing. Now, I am paying $40/month to connect each device. For their Unlimited Plan, it would drop to $20/month to connect, but the cost of the plan (Unlimited vs 30 GB) would increase, and the overall bill would be higher. Now, there's one other thing, and it makes all the difference. As part of the Verizon Edge plan (told you my plan was old) I get a discount for financing devices. The $40/month drops to $15/month, which is less than $20. There's another way of looking at it, though. If I play down enough to leave $600 owing on the phone, my monthly payments for the phone will be $25/month. That's the amount of the discount. It's like getting $600 off the cost of the phone. Meaning I can buy an iPhone X for $400. Heck, you'd buy an iPhone X for $400 if you could. 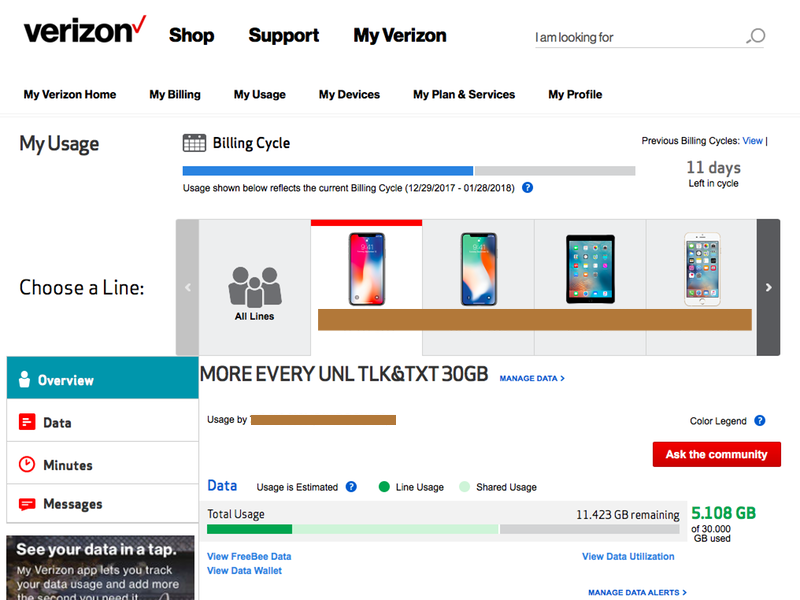 Now, every time I go into a Verizon store for anything, they try to get me off the plan I'm on and onto an Unlimited Plan. I'm not budging. You see, that 19% work discount isn't applicable on an Unlimited Plan. So, I'd lose that. I'd also pay more for the plan. And I'd pay more for a phone, about $120/device. ($40/month becomes $20/month, but no Edge discount, meaning a higher net cost per phone.) The total cost would be more. I'm staying on the plan I'm on. Oh, I was planning on writing about the iPhone X and what I thought of it. Then I got sidetracked. So, here's what I think of it: I like it. See, I can be succinct if I try. It didn't take me long to get used to Face ID. More here.